Here at Home to Indy, we work with a lot of newly-engaged couples looking to purchase their first home. It's such an exciting time in their lives, and we love being part of it! If wedding bells are in your near future, you’re likely looking for just the right spot to say your “I dos.” With all the options out there, it can sometimes be overwhelming to select the right venue. Below you’ll find some questions to consider as that will help you pick your perfect location. 1. Do we have to invite great aunt Martha’s son I’ve never met? The first place to start is with your guest list. You and your fiancé need to make a list of the people you want to witness your nuptials. If you’re sending out 500 invitations, the local city hall likely won’t be able to accommodate all of your guests, let alone a band, if that’s something you’re wanting. If you want a destination wedding, you need to consider if your family/friends will be able to attend. Rio de Janiero may be gorgeous, but it also may be financially impossible for some of your desired guests. When it comes to your wedding budget, only you can determine how much you want to spend on the venue, let alone the dress, flowers, food, photographer, etc. Costs can range from free (if you use a rich neighbor’s well-groomed backyard) to upwards of $20,000. Choose a range that you’d like to stick with and start there. 4. Do you want to be a June bride? Availability can be difficult if you’re planning for a quick engagement. Some wedding venues book up years in advance. One way to get around this is to have your wedding on a Friday or a Sunday, which are often more availiable than traditional Saturdays. 5. How much work do you want to take on? You may have always dreamed of getting married at your grandma’s ranch. But you have to consider who’s going to move the hay bales, clean out the barn, place the port-a-lets, and set up the tables and chairs. While reception halls still require a decent amount of planning, they usually come with a wedding coordinator to help iron out all the details. 6. Do you want your wedding and reception at separate venues? 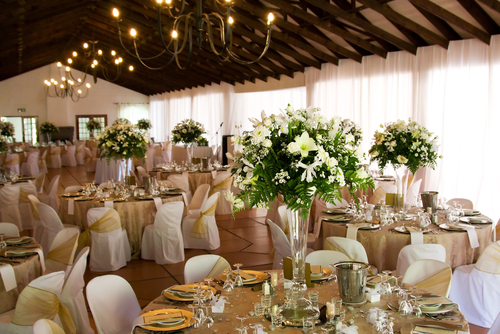 If you have both your wedding and reception at the same site, you can save on rental fees and decorations. 7. Have you looked outside the reception hall box? If you don’t want a traditional reception hall, lots of cities have unique places to host a wedding. Check out local zoos, museums, botanical gardens, and libraries. Oftentimes, you can get a discount on a Masonic Lodge or Country Club if you have family who are members. 8. How well do you know the church? If you plan to get married at a church, make sure you ask about their stipulations. Some churches only allow members to use their facility. Others only let their pastors officiate or certain songs to be sung. 9. Do you want to worry about the weather? If you choose a venue that’s outside, you need to consider the weather. An “in case of bad weather” plan is usually put in place, which can require more planning. You also need to consider if it is public space. Noise can be an issue, as can public festivals if you were considering a park. 10. Does this include the kitchen sink? Make sure you ask lots of questions about what is included in venues you check out. Some places provide linens and silverware, while others require you to rent them from an outside vendor. Are there additional set up fees? Cake cutting fees? How many hours do you get with rental? Is alcohol allowed? Can you set up the day before?